United Nations Special Envoy for Syria Geir Pedersen says he has held “detailed substantial” talks with Syrian Foreign Minister Walid al-Muallem on efforts to find a political solution to the country’s eight-year-long war. “We are now addressing all the issues so all the issues are at the table,” the Norwegian diplomat added without giving more information. It added that the two sides spoke about Pedersen’s diplomatic activities since his last visit to Damascus last month. 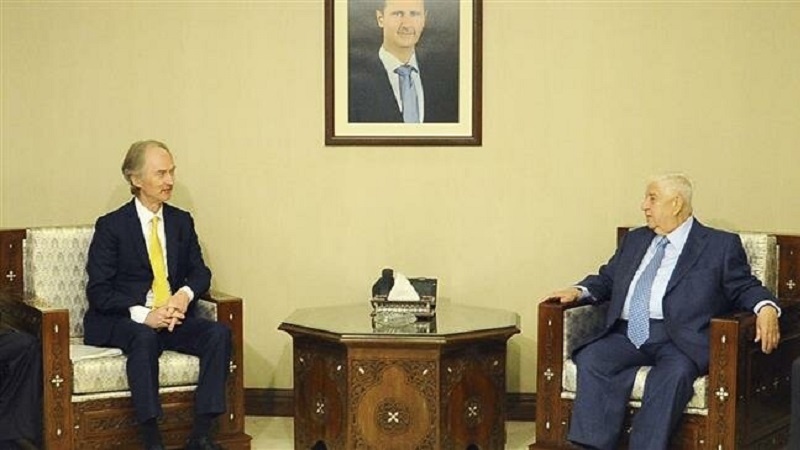 During their meeting in March, the Syrian foreign minister and deputy prime minister told Pedersen that his country’s constitution is a “purely sovereign affair” and emphasized that Damascus would allow no foreign interference in that area. In a joint statement issued back in December, the Islamic Republic of Iran, Russia and Turkey agreed to step up efforts aimed at convening the first session of a UN-sponsored Syrian Constitutional Committee early next year in a bid to begin a viable peace process to the country’s seven-year-old conflict. In an address to an Arab League summit in the Tunisian capital of Tunis late in March, Secretary General of the United Nations Antonio Guterres stressed the importance of guaranteeing Syria’s sovereignty and territorial integrity in any resolution on the conflict in the Arab country.